Sometimes, you find the best things when you're not even looking; similar to walking along one of the world's beaches, finding lost jewelry, an old coin, or maybe even a memento from the past, that was otherwise thought to be lost or gone forever. The latter is exactly what happened, a little over a month ago, while I was hopping from one small shop to another, along the Atlantic City Boardwalk. Being an avid collector for years, I've learned to appreciate the hunt for a good cap. That being said, there are always a few in the back of your mind that you don't necessarily pursue, but hope to stumble upon down the road. In this sense, it's more of a desire to find a specific logo. The reference pertains to the stylings of the now extinct Montreal Expos. 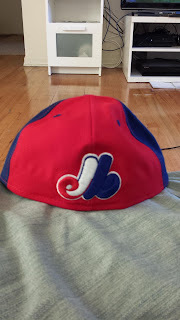 Since the conclusion of their active history at the conclusion of the 2004 season, dead-stock Expos caps, such as the retro-pinwheel design above, have been dwindling in numbers, thus becoming more and more difficult to find. Sports Collection, located at 1731 Boardwalk, Atlantic City, New Jersey, had this beauty tucked away in the back of the store, along with multiple others unique finds. 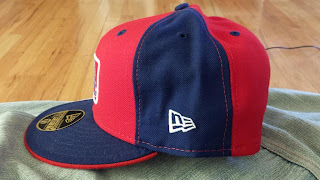 I understand it isn't an on-field cap, which is probably enough to turn some people off from it, but it comes from a time where my fitted collection began. It brings back memories of a time before a closet full of caps, when I could only dream of amassing as many as I have to this point. All that, along with the fact that I paid in the ballpark of $20 for a mint condition cap (sticker still intact) was enough for me to pull the trigger. The cap above features alternating blue and red panels around the crown, a blue brim, red under-brim, an oversized MLB logo featuring the Expos word mark inlaid, and the classic Montreal Expos "M-E-B" logo, centered across the rear 2 panels. 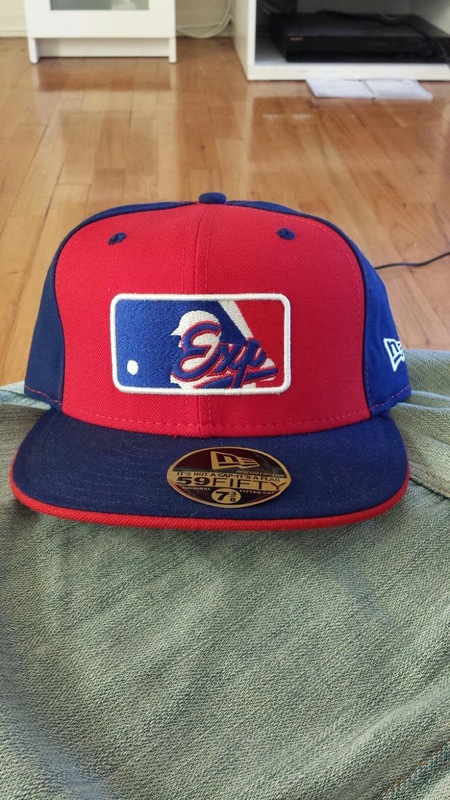 If you'd like to add some retro caps to your collection, and have a few minutes to explore, drop them a line at the contact page of the above website. When I was there, they were extremely friendly, and sincerely appreciated my interest in their accumulated stock of great caps. It can't hurt to give it a shot.